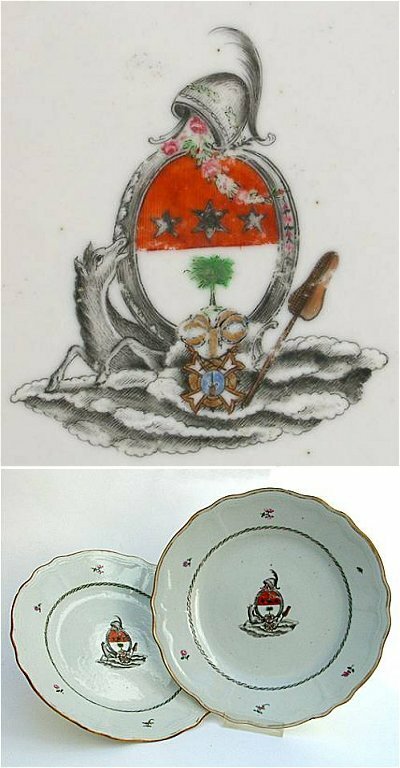 These plates could have been ordered by either of the two brothers - Erik Mikael, Colonel in the Navy (-1769), and Ulrik Gottlieb, also Naval officer (-1795) - of the Swedish Noble family of Ehrenbill, while the second might be more likely. The decoration is in the thin Fencai enamels of the late 18th century and with the restricted colors of the highly fashionable style of the Neo-classicism. The coat-of-arm is surrounded by symbols of the navy and the Order of the Sword.